How did you first get introduced to the Indian performing arts? When? I was in search of a land where I could express in a total and unrestricted way those inner questions of the soul that could not find satisfaction in any of the solutions offered by the present patterns of living of this Western civilization. After completing my doctorate in philosophy and having worked for some years in both traditional and experimental theatre in my own country, Italy, I followed the calling of ancestral and inexplicable paths and reached this land of Orissa (now Odisha). Here, completely dedicated to the sacred art of Indian dance at the feet of my guru Padma Vibhushan Kelucharan Mohapatra, I am able to give shape to the inner striving of the soul and overcome the anxiety of human existence. I have been living in Odisha since 1979 in close contact with the people, their language and culture. I have also trained in Chhau dance of Mayurbhanj under the guidance of Guru Shri Hari Nayak, obtaining the title of ‘Acharya’ from the Sangeet Mahavidyalya of Bhubaneswar in Orissa. Do you continue to perform and teach? I have given several performances and lecture-demonstrations in all the major centres in India, written articles on Oriya culture that have been published in Indian and foreign magazines, done research work for film-documentaries on Odissi and Chhau dances and conducted practical dance workshops for dancers and theatre workers by invitation from different institutions in India and abroad. I have performed in all the major dance festivals in India as well as in Italy, Argentina, Poland, France, Germany, Holland, Denmark, Hong Kong, Japan, the United States, Australia and Israel. Have you adapted Western themes in the Indian classical style? I choreographed the Greek myth ‘Echo and Narcissus’ in Mayurbhanji Chhau, which was a revelation at the East–West Dance Encounter held in Mumbai in April 1985. Some of my other works include ‘The Wreck’ (December 1988), ‘Icarus’ (July 1991), ‘Pancha Bhuta’ (January 1996), ‘The Journey’ (September 1998), ‘Images of Change’ (March 2000), ‘Surya Devata’ (December 2001), ‘Jarjara’ (January 2003) and ‘Still I Rise’ (February, 2005). Of course, I have worked on several Indian themes as well. I have also published books: The Making of a Guru – Kelucharan Mohapatra, His Life and Times (2001); Traditional Martial Practices in Odisha (2012); and My Journey – A Tale of Two Births (2015). Your tremendous contributions have gained recognition. Can you share some of your achievements? I am a top-grade artiste with Doordarshan and am empanelled as ‘outstanding artist’ in Indian Council for Cultural Relations (ICCR). I have been awarded the prestigious title Leonide Massine for the Art of Dance in Italy in September 1992 and the Raseshwar award by the Sur Singar Sansad, Mumbai, in December 1994. In May 1996, I won the National Award for Best Choreography for my dance direction in the Bengali film Yugant directed by Aparna Sen. In 2009, I received the Pandit Jasraj Award from the Rotary Club of Hyderabad, the Order of the Star of Italian Solidarity from the President of Italy and in 2016 the NALCO Kharavela Award for my role as distinguished guru in Odissi dance. In January 2006, I was awarded the title of Padma Shri from the Government of India for my contribution to Odissi dance. How did you first get introduced to the Indian performing art? When? In 2008, I discovered Bollywood dance during some cultural workshops in the town of Colmenar Viejo, Madrid, where I am from. From that moment I felt a great interest to know more in depth the dances of India, and especially the Indian classical dances, which I consider to be close to my way of being. Then I found a Bharatanatyam course in my city and I met my first teacher, Sohini Roychowdhury. From that moment I was totally in love with this dance. During one of the trips we made with the company, we visited Kerala, and saw classical dance performances of Mohiniyattam and Kathakali. Later I started to attend Mohiniyattam classes in Madrid with Master Eugenia Carrillo, and I then applied for an ICCR scholarship to travel to Kerala. Initially I thought about applying for the dance scholarship, but since all these dances need interpretation, I decided to learn Kathakali to be able to complement my career as a dancer. Since 2016 and with the great help and support of my tutor from ICCR, Madhurkankana Roy, I have been learning Kathakali in the Kerala Kalamandalam Deemed University of Art and Culture, under the tutelage of my teacher Arun Warrier. I larn Bharatanatyam from Manu Master and Mohiniyattam from Kalamandalam Hymavathy. What inspired you to take this up earnestly? Are you pursuing this as a hobby or profession? My main dance form is Bharatanatyam; it helps me to express myself better. Kathakali is a perfect complement to my training as a dancer, and my second love, Mohiniyattam is a form of meditation in movement for me. I simply study these dances for love and passion, to know myself better and to know other cultures through art. How do you relate to the themes and philosophies underlying the compositions? Have you also adapted your traditional lore to this art form? My way of relating to the philosophy underlying this art is through conversations with my teachers, my colleagues and my neighbours in the town of Cheruthuruthy, attending all the shows I can and reading many books and articles on the subject. At the same time, I have made several adaptations of traditional music from my country with Indian dances and I collaborate regularly with one of the classic groups of the hip-hop scene in Madrid, Niñato y Agustito, adapting their lyrics to sign language with the hands, typical of these dances, called mudras. Do you get opportunities to perform back in your home country? Are you teaching this art there? What is the acceptance like? In Spain, I have performed in different events related to culture, dance festivals, tourism fairs, street performances and music videos. 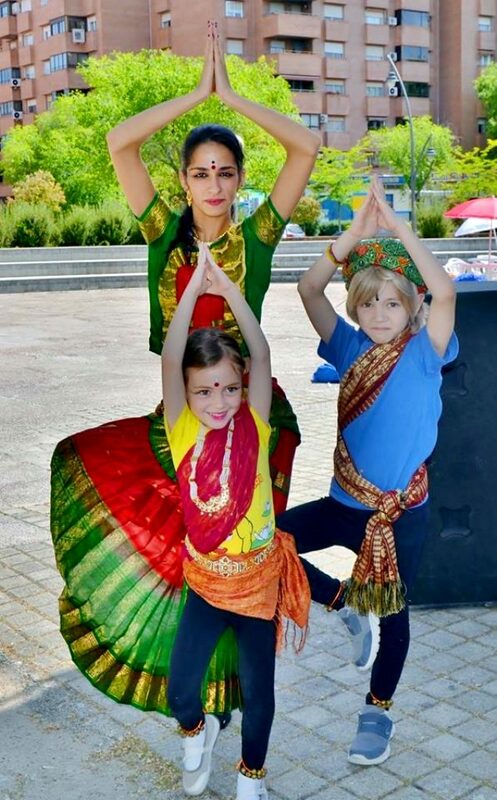 I have also given several workshops of Bharatanatyam and regular classes in different schools, which have very good acceptance, and I hope to continue doing when I finish my studies in India. How did you first get introduced to the Indian performing arts? I soon started travelling to India and found a wonderful guru in Adyar K Lakshman. I started studying at his school Bharata Choodamani. I graduated with an M.A. dissertation based on the Mahabharata and then I got an incredible opportunity, a scholarship from the University of Milan for International Excellency, to study in India for a full year. That was the turning point. I came to Chennai and studied there 13 months continuously, every day at Lakshman Sir’s house/school, the whole day. I also underwent training in abhinaya with Smt Indira Kadambi, and music and nattuvangam training with Sri Seetharama Sharma sir. It was the best year of my life, and in 2009, I did my arangetram at the Kapaleeswarar Temple in Mylapore, Chennai. Coming back to Italy wasn’t easy at all… I realised I was completed affected by ‘Indianity’! Till that point I did not understand that there was a very well-panned destiny for me, I was only studying what was giving me happiness. But then I realised that the practical was linked to the theoretical studies and my life was being guided towards Bharatanatyam. So since then I’ve been pursuing it as my main profession. I’m constantly studying, and I love it. I’m currently working with the traditional repertoire and language. Of course, the language is constantly evolving… So sometimes I think I’m developing the traditions, adding maybe a little of my previous experiences into it. In Italy, I perform quite often, but we have big challenges as we don’t have Carnatic musicians in Italy. We also don’t have a big Indian community (and very few South Indians), so it’s very difficult to get support. In spite of that, there are a lot of Italians interested in understanding the Indian culture and dance. I teach regularly, my school is called Sangam Academy, and has quite a good number of students of all ages, from different countries. We have simple courses as well as professional ones, where they have to also learn theory (history of India, Sanskrit, dance history, theory of dance like Natya Shastra) and also music, nattuvangam and abhinaya. We have some Indian teachers coming over twice a year to give intensive workshops.